After the summer of 2011 I began using a phrase to describe the way I understand the church. In the midst of our extended denominational conversation about sexuality we intentionally gathered the responses from the local hearings that were taking place. Far from statistically sound, the information gathered did provide an interesting picture of the denomination as it thought about the question. The committee that reported back noted that about 2/3rds of the church existed right about in the middle while 1/3 was divided between either end of the spectrum. Students of any trend would say that such a range of opinions would match what is known as the bell curve- the center populated by two thirds of the population and the ends tailing off in either direction. Leading up to the report, some said that there was no bell curve among the Brethren, and that two thirds in some way opposed opening the question regarding sexuality. To be sure, this is true. When the curve is assessed from the perspective of opening the question, there is a more than 50% + 1 who would oppose the question. But that does not mean that all are in agreement with the reasoning why. When I walked away from the report in 2011, I quickly latched onto another reality. There is a church in the middle of the poles. There is a church in the middle who has yet to be convinced by the heightened rhetoric of the extremes. Of course there were some who quickly replied that I was trying to take a middle road on an issue that there could be no middle road- that justice or purity would tolerate no middle ground. But that was to prove the case even more- the ends of the spectrum have too handily defined the conversation. The Middle Church, or the 2/3rds who chose church unity, have yet to be convinced by the extremes. And we, as the leaders of the church have yet to ask the question that gets at the heart of the middle ground. Take for instance what happens when you cut an apple. 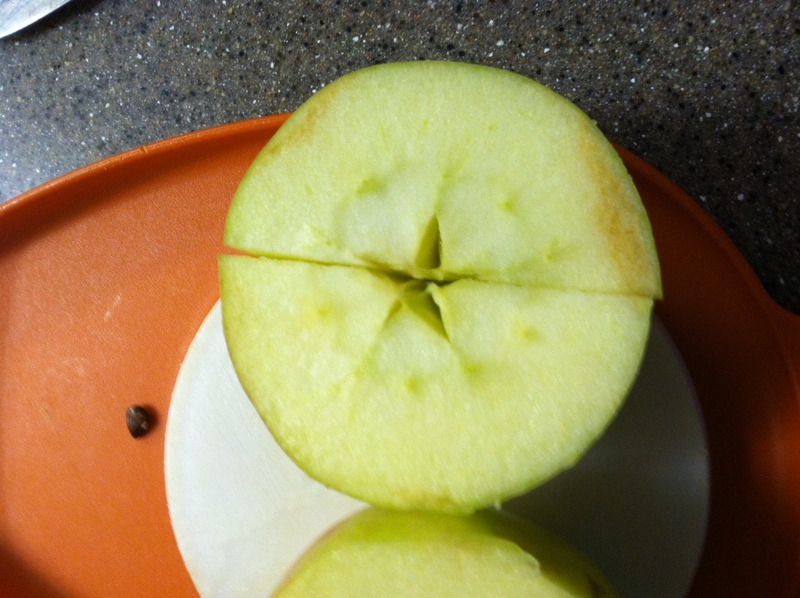 Any kid is fascinated when an apple is cut and the star of seeds appears in the center. But if the adult is cutting on the easier angle- with the natural feet of the apple steadying the fruit for a bisecting cut from the stem- the magic star vanishes. In other words, how you cut defines the picture that emerges. 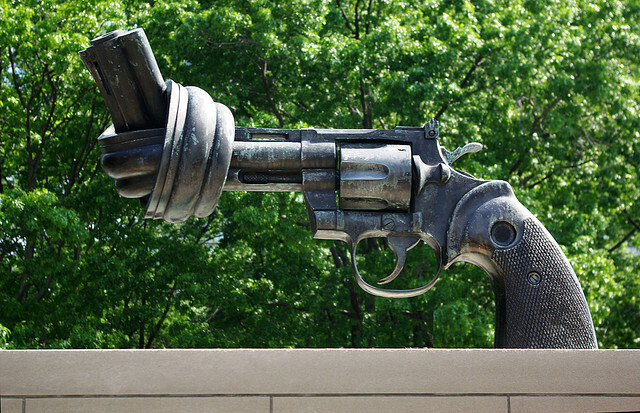 In the scientific lingo of the Heisenberg principle, our very gaze impacts the outcome. In the case of our heated debates about sexuality, gender, and politics we are cutting on the angle that may be the easiest but reveals an unconvincing image. What if another approach or angle is available, but we lack the imagination to turn it over? What if the ends of the spectrum have so captured our thoughts that we can’t see the forest for the trees? Recently, it was said that the political climate of the US isn’t dividing the church, and that even without the binary rhetoric of the Democrats and Republicans the church would divide based on competing theologies. That maybe so, but I am not convinced that the middle church isn’t asking a completely different question than the so-called poles, even within the realms proper to the church. And that is just it. For all the talk of the polarization of our culture, both in and out of the church, there are usually only two options. In the jargon of post-structuralism that is called a binary- an either/or. Better stated, we are constantly presented with a false dichotomy. In the past six weeks I have been apart of four different arguments that were stuck in the world of binaries. The problems, as those in the argument saw it, were that either one is Catholic or Anabaptist, Academic or Lay, Voting or Not-Voting, Naive or Just. Thankfully, in just about each of these, it became clear that the binary was bull. Whether or not one is schooled in the esoteric world of post-structuralism, it doesn’t take long before something smells afoul when the rhetoric employs the words “either” and “or”. The more I encounter the either/or arguments the more I realize there is a whole group of people in the middle longing for a different question all together. Two things have made that clear to me in the same six weeks. As the editor of this blog, I took some heat for publishing a post asking if voting was the virtuous act that so many claim it to be. Some clearly were angry that the question was even asked, while others pressed for a more balanced, if not binary series- a pro and con kind of conversation. I was amazed at the post I received the day of the election. While the two postings argued for different actions, the intent and nuance in the middle was strikingly similar. The concerns that emerged from this intersection of the two posts sounded very similar and yet, the call to action was different. In the end, the question about voting didn’t seem all that heated since the two sets of writers clearly were talking the same language. The second event is still in process. As a group of us Brethren theologians have gathered privately, it has become clear that a new mode of conversation is needed. Shaped by a new medium of discourse, we are asking theological and practical question, in a clearly conversational way. In other words, social media is redefining the very modes of theological discourse. As one of these NuDunkers put it, we are looking for ways to be practical and theoretical, concerned about people and passionate about ideas, pastoral and academic. The trick is clear, those binary thinkers around us want us to be either/or. Are you NuDunkers gonna offer anything of substance? Subtext: Are you going to gather the liberals or conservatives. Short answer: No, we are cutting the apple another way. We are looking for the star and not the poles.